I remember it vaguely. Coach and I were sitting in a back room in the Paducah Kentucky and he was laughing at me. Partly because I had just received a pain killer shot that was most likely making me say odd things. The other half had to do with why I was in the ER in the first place. It was right after our team had won our regional track title. I wanted to get to the midfield for our team photo chewing our trophy (yes, we bit our trophies) and thought hopping the rail in the stands would be quicker than walking around. Had my toe not caught the rail and I had not fallen 8-9 feet down onto my wrist breaking it, it totally would've been a good idea. So there we were, in the back room, the National Coach of the Year at that time making fun of one of his athletes for making a dumb decision. In a good way of course - not in a mean way. So when I got a call saying he had received a compound fracture in his leg two days later playing bocce ball out of a tree, I decided it was my turn to make fun of him. In a good way of course. But that's not my main memory of Coach Rowe. Just one of our last interactions as "coach and athlete." My wife and a few of my friends have probably heard me say this before. They probably didn't know what I was talking about. It's a line I got from Coach Rowe when things got tough. We could be dying from a workout and all we would hear is "Cowboy up, get on the line." And we would get back on the starting line for another brutal repeat. I remember another time my senior year of cross country that I discovered the morning of a cold race that I may have sports-induced asthma. My chest was tightening up on the warm-up and I was very short of breath. I went to Coach and told him what was going on. All he said was "Cowboy up, race starts in ten minutes." Sure, I didn't have a great race that day. However, the fact I competed the way I did that day helped build my mental toughness that much more. Coach didn't take excuses. Even when we had nothing left, we were expected to be fast. I honestly believe that emphasis is the only reason I was able to finish the Chicago Marathon a couple of years ago. My body cramped up badly at 22.5 due to extreme heat. However, I knew quitting wasn't an option. Going down wasn't an option. It never had been. I had to Cowboy Up and finish the race. "There ain't no horse that can't be rode; there ain't no cowboy that can't be throwed"
Coach said this more than once. It was a way to take us down a notch and humble us if we were on a streak of success. We knew that there wasn't such thing as an invincible team. Going into my senior year this was extremely relevant two ways. Our group had won the last two cross country state titles and had our eyes on a third. Coach Rowe had just won National Coach of the Year and, with a mainly senior squad, it looked like we were going to have a record season. However, Coach didn't let it go to our heads....which was hardly ever the case. Every time we faced Louisville St. Xavier, we lost big time, usually by 40-50 points or more. Going into the state meet that same year, never even having poised a remote threat to St. X the whole year, Coach was able to use that line to motivate us. St. X wasn't invincible. No team out there was. There was no cowboy that couldn't be throwed. It was that attitude of confidence in us and our training that Coach had that helped us not get scared of anyone when the time counted. That year, my last cross country race, we went on to win the state title again (for the third year in a row) beating the next team by 30 points. Coach is a motivator. 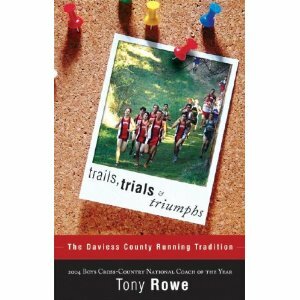 Probably one of the best minds in distance running I've met, or even heard of. On top of that, he was a great Christian example to any guy that came through his team. He didn't let us waste our God-given talents, he made us use them to the best of our ability. His house was our house during the summers. Whenever we would go train at a park near his home, even after I had graduated and was running full-time at WKU, we could pop in their home unannounced or cool off from our run in their pool. We started every race or Red Line training (I could write a whole post just on Red Line alone) with prayer. Ended hard workouts thanking God for getting us through the run. He didn't let potential political correctness that could come with his job as a teacher come in the way of sharing his faith. Coach didn't wear his faith on his sleeve but showed it in what he did and how he treated his athletes. Tomorrow afternoon, Coach Rowe will be celebrating his retirement from full-time coaching. I can't really wrap my head around a Daviess County High School team without him at the reigns. But it's a well-deserved retirement. He's poured a lot of himself into a long and decorated career doing what he loves. The lessons of perseverance and faith I learned from him in four years are ones I've been able to carry throughout college and into my career. Coach Rowe is retiring but I don't see him fading from the running scene entirely. It's too much part of who he is. You can read the book he wrote (pictured here) by clicking here. See more videos from our 2004 season here.